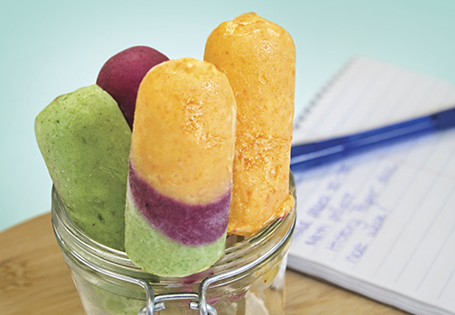 Yummy ice pops jammed full of fruit and vegetable goodness. The best part is, the kids will never know. For the Ice Pop Base: In a saucepan, whisk to combine corn starch, milk, cream, sugar and salt. Bring to a boil and cook for 1 minute, stirring constantly, until mixture thickens. Transfer to a pitcher for easy pouring. Stir in vanilla. For the flavor choice: Combine all ingredients in a blender and pulse until smooth. Stir into the ice pop base. Pour the mixture into ice pop molds and insert pop sticks. Freeze until pops are solid, about 6 hours, or up to a week. TIP: Before removing ice pops from mold, run mold under hot water for a few seconds.